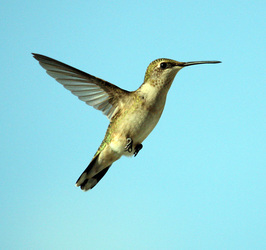 The Ruby-Throated Hummingbird (Archilochus colubris) is 3 to 3.75 inches in length. The male has a straight, black bill, a black face, a green crown, and a deep red throat. The males also have green upperparts, greenish sides and flanks, grayish white underparts, and a forked dark green tail. Females have a white chin and throat, greenish upperparts, white underparts with a buff wash on the sides and flanks, and a rounded tail with white-tipped outer feathers. 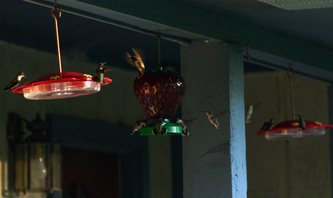 The song of the Ruby-Throated Hummingbird is a series of rapid squeaky, chipping sounds. This hummingbird has a range that extends to most of the eastern United States. They are common to fairly common in their breeding range. 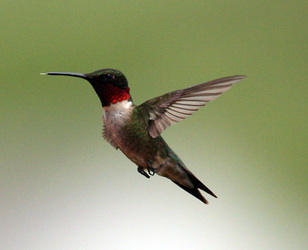 The Ruby-Throated Hummingbird will come to feeders for sugar water; however, the red food dyes that are added to some hummingbird solutions are harmful to their kidneys, so NEVER add food coloring to your sugar solution or buy solutions that have red coloring. They are also attracted to many flowers including Red Columbine, Salvia, Honeysuckle, Bee Balm, Jewelweed, Trumpet Creeper, and Butterfly Bush. Click here for additional information and a range map. Click on the players below for Ruby-Throated Hummingbird vocalizations.